Pillsbury Instant Pot® Pressure Cooker Sweepstakes – 25 winners! 0Win an Instant Pot (25 winners)! ENTER SWEEPSTAKES HERE – Pillsbury Sweepstakes page. ENTRY LIMIT – Limit one (1) entry per person, per email address, per day. ELIGIBILITY – Only open to legal residents of the United States and the District of Columbia, who are 18 years of age or older and located within the United States at the time of entry. 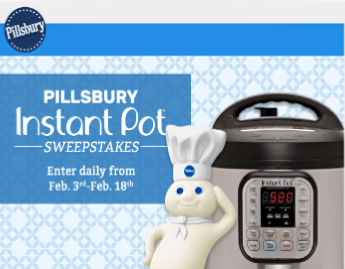 SWEEPSTAKES ENTRY PERIOD – Enter the Pillsbury Instant Pot® Pressure Cooker Sweepstakes from 12:00 A.M. Central Daylight Time (“CDT”) on February 3, 2019 to 11:59 P.M. CDT on February 18, 2019. PRIZES – Twenty-five (25) Prizes: Each prize is an Instant Pot® pressure cooker. Approximate Retail Value (“ARV”) of each prize is $100.00. Total ARV of all prizes: $2,500.00. WINNER’S LIST – A list of winners will be posted on or about March 8, 2019 at https://www.pillsbury.com/sweepstakes/instant-pot/rules. Pillsbury Instant Pot® Pressure Cooker Sweepstakes – Win an Instant Pot! Win an Instant Pot Electric Pressure cooker (25 winners)! ENTRY LIMIT – Limit one (1) entry per person, per email address, per day throughout the Sweepstakes Period. 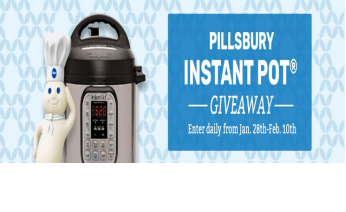 SWEEPSTAKES ENTRY PERIOD – Pillsbury Instant Pot® Pressure Cooker Sweepstakes from 8:00 A.M. Central Daylight Time (“CDT”) on January 28, 2018 to 11:59 P.M. CDT on February 10, 2018. PRIZES – Twenty-five (25) Prizes: Each prize is an Instant Pot® pressure cooker. Approximate Retail Value (“ARV”) of each prize is $100.00.